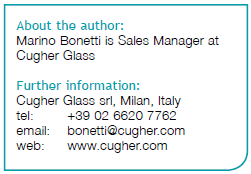 Flexible engineering and continuous customer care are essential levers in the production of highly customised glass printing plants, as offered by Cugher Glass. 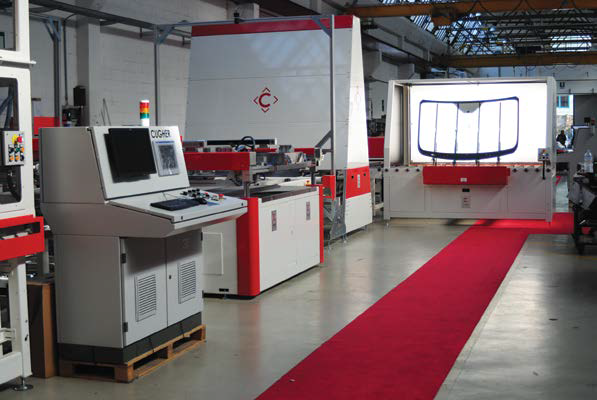 Cugher Glass designs, manufactures and sells turnkey plants for glass screen printing that can be specially customised and feature a high innovation and automation content. This year, Cugher celebrates its 50th anniversary. Based in Novate Milanese (Milan), the company’s main references are found in the automotive, home appliance and architectural glass sectors. The manufacturing range can provide complete coverage of the production cycle, starting immediately after the cutting and washing of glass sheets, up to the phases preceding toughening and bending processes. Example of a Cugher printing line. software of plants supplied. 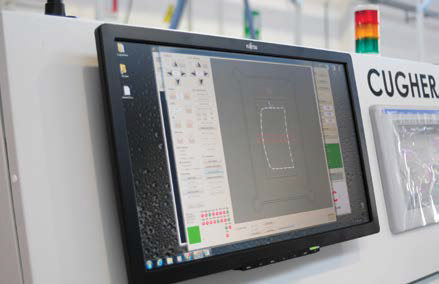 In addition to the printing machines, the configuration of glass handling/ management systems and drying ovens are customised, as well as the software that drives the system. The Internet of Things (IoT) is an essential requirement of current industrial production: Cugher software integrates with other control and drive systems by connecting all parts of a line. The company’s technical department is flexible and is characterised by a close connection with the sales team in keeping a consolidated attitude towards every customer by listening to and observing their individual requirements. From the start of negotiations, Cugher employs important resources to respond to the specific needs of the customer with the delivery of innovative solutions. In the following steps, the technical details of each requirement are gradually analysed more deeply. When negotiations are successfully completed, a kick-off meeting is held in order to finalise the technical specifications for the line to be installed. In synergy with the skills of an engineering team of the highest level, this proactive approach has generated major advances in terms of process knowhow that very few in the sector can match. Every demand generates a technological response that consolidates and increases the knowledge process so that Cugher can respond more effectively to every requirement. The Made in Italy approach is a distinctive feature of an industry that has always been ready to take different paths to identify solutions that respond to and sometimes anticipate market requirements. Cugher is part of this industrial panorama. In the field of glass screen printing, the company is an undisputed innovator, thanks in particular to the driving force provided by the automotive sector.